Avril Lavigne was singing at a concert after a Tampa Bay Rays game. However, she was upset with the fans who booed after some technical malfunctions during her first song. She used a number of choice obscenities to respond to the fans and the team had to apologize for her outburst. An artist can turn a crowd against police, a facility, or a team. An artist can also gain control of a rough crowd through requesting positive conduct by the crowd. A facility need to know how cooperative a performer is in case of an emergency. I handled a case several years ago involving Eminem and he did a great job of getting the crowd to back-up by turning his request into a game. He basically asked the fans to take steps backwards similar to a dance. It worked well and allowed the staff to attend to some injured fans. Sing it with me: The roof! The roof! The roof is on fire! Thousands might have dusted off that old-school hit at Dodger Stadium on Saturday night as it appeared that the roof literally was on fire in the right-field upper deck. 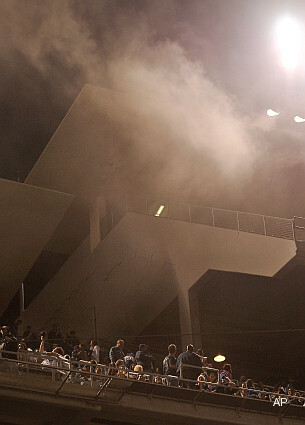 Smoke began billowing into the seating area of the ballpark during the fifth inning of the Los Angeles Dodgers‘ 6-1 loss to the Florida Marlins. No one was evacuated from the park, but some reportedly suffered from smoke irritation. The smoke wafted from the upper tiers of the ballpark down to the lower levels, and eventually reached center field. Marlins outfielder Chris Coghlan(notes) definitely noticed something wrong in the air. “I could smell that smoke and I was like, ‘That ain’t a hot-dog stand.’ Then I saw this huge puff and I said, ‘Oh, my God, this place is on fire and we’re still playing,’ ” [he] said. No, it wasn’t a hot dog stand ablaze. According to the Los Angeles Fire Department, the fire originated from a small warehouse below the reserved level. Officials on the scene said a small fire of paper products was the cause of the smoke, and was put out by firefighters in 20 minutes. The stadium’s public address announcer informed the crowd of the situation during the sixth inning, assuring them that the fire was under control and there was no need to evacuate the ballpark. The family of Bryan Stow, the San Francisco Giants fan who was severely beaten at Dodger Stadium, filed a civil lawsuit Tuesday claiming faulty security measures and defective facilities contributed to his attack, court officials said. The lawsuit, filed in Los Angeles Superior Court, names the Los Angeles Dodgers Corporation and its owner, Frank McCourt, as defendants. The suit lists Stow’s parents, Elizabeth Ann Stow and David Edward Stow, as plaintiffs on behalf of his two minor children, Tyler and Tabitha Stow, according to court spokeswoman Elizabeth Diaz. “It is unfortunate that such a storied and well respected baseball club such as the Los Angeles Dodgers has been made to suffer due to the cutbacks and mismanagement by its owner Frank McCourt and his various corporate entities,” the lawsuit says. The complaint alleges that cutbacks led to a major downsizing of security as a cost-saving measure due to McCourt’s personal family problems and to” fund his lavish lifestyle.” McCourt and his wife, Jamie, are in the middle of a contentious divorce proceeding. His divorce attorney, Steve Susman, declined to comment on the suit. Stow, 42, was attacked in the stadium parking lot following the first game of the Dodgers’ and Giants’ seasons on March 31. Stow, a paramedic by training, had gone to the game with friends in celebration of the Giants’ World Series victory last season. The lawsuit alleges that security officers and managers at Dodger Stadium were apprised of a history of aggressive violent behavior and criminal gang activity in some crowds at the stadium, and neglected to provide reasonable safety mechanisms to protect Stow, including the failure to hire a security chief for six weeks prior to opening day. A “half-off” alcohol promotion for all day games also was cited in the suit as a contributing factor in the disorderly conduct and violent aggressive behavior. According to the suit, prior incidents of violence should have resulted in the hiring and presence of more uniformed police officers instead of security personnel dressed in trousers and polo shirts. The suit cites a parking-lot incident at the stadium on September 19, 2003, in which a Giants fan was shot and killed by a reputed Dodgers fan. A then-20-year-old California man was convicted and sentenced to 50 years in prison in that case, according to the Los Angeles County district attorney’s website. In 2009, a man was attacked on opening day as the Dodgers hosted the Giants, according to the lawsuit. “The decision not to place uniformed (Los Angeles police) officers created a relaxed, intimidating atmosphere at Dodger Stadium,” the suit says. Before the attack, Stow had texted a family member fearing for his safety inside the stadium as fans repeatedly taunted and yelled profanities at him, according to Stow’s relatives. Several fans threw hot dogs, peanuts and trash at Stow and his companions, the suit alleges. “Dodgers personnel walked up and down the aisle directly adjacent to where Stow and his friends were seated. Ushers were present and actively viewed aggressive behavior towards Stow, but failed to take any preventative measures,” the suit says. The suit claims that Stow was subjected to harassment, threats and intimidation even as he left the stadium and entered the parking lot area and that security personnel, knowing those dangers, failed to diffuse the escalation of violent behavior or intervene and ensure his safety in a reasonable manner. The suit also claims that security officers allowed Stow’s alleged attackers to follow him out of the stadium and into the parking lot taxi loading zone where the beating occurred. In the lot, two men confronted Stow and — unprovoked — began kicking and punching him while yelling profanities about the Giants, police said. The suit also alleges that the security response time was inadequate, in part, because of poor lighting in the lot. It took 10 to 15 minutes after the attack for personnel to reach Stow. “Dodger Stadium is the third oldest stadium in baseball. Without the implementation of adequate security measures by the Dodgers defendants, along with inadequate lighting fixtures that have been in existence since the opening of Dodgers Stadium in 1962, Stow was inappropriately exposed to the aggressive acts of third parties,” according to the suit. Citing club policy, a spokesman for the Los Angeles Dodgers declined to comment on the lawsuit. On Sunday, Los Angeles authorities announced the arrest of a man that police described as the “primary aggressor” in the attack. Police said Giovanni Ramirez, 31, was jailed on $1 million bail, and the investigation was continuing. Police said later that Ramirez is a parolee and documented gang member associated with the Varrio Nuevo Estrada street gang in East Los Angeles. In 1998, Ramirez was convicted of robbery and possession of a firearm in 2005, court records show. Stow’s mother, Ann Stow, said recently that her son was first hit from behind, at which point he fell and his head hit the concrete. “It was just a brutal attack,” she said. “Whatever that guy hit my son with, Bryan was unconscious before he hit the ground, so he had no way to protect his head. Stow was taken out of a medically induced coma over a week ago, and has since shown signs of some cognitive function, Los Angeles neurosurgeon Dr. Gabriel Zada said. He was transferred last week from Los Angeles County-University of Southern California Medical Center to San Francisco General and Trauma Center, bringing him closer to his home, Zada said. Authorities are searching for at least two other suspects in the beating. The attackers fled in a white four door late model Mitsubishi or Acura vehicle with tan interior, police said. The entire outfield looked like a driving range on a busy weekend afternoon when a hail storm moved into the Twin Cities and caused a 64-minute delay during the Minnesota Twins game. It should be noted that the biggest concern is not just the players, but the Patrons in the stands. The players can run to the dugout, but if hail stones the size of golf balls are hitting the field then patrons are also probably being hit as well. Some can find shelter in the concourse and some might be covered by a roof or awning, but others might not be as lucky. An emergency action plan needs to look at such weather conditions to avoid major issues.